Pelican Watch is a great condo complex to rent a vacation rental in. 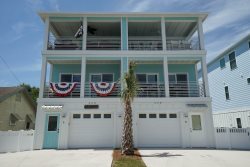 Pelican Watch, located at Carolina Beach, has nice, oceanfront 3 bedroom 2 bathroom units that feel more like a home than a condo. There are two pools, one indoor and one outdoor, that you have access to when you rent a condo here. Please take a look at these two great rental condos in Pelican Watch.